We are a family-owned and operated company, serving collectors and dealers worldwide since 1991. 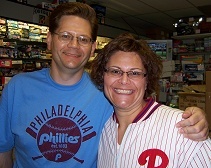 You know us as Steve and Heidi, a brother and sister from Philadelphia, Pennsylvania; and we started Georgetown's mail order company working out of our father's basement. Our business continued to grow over the years and we opened a retail store in 1996 from which we now run our mail order business. Now as of 2010, we have added several warehouse locations to house our extensive inventory. We're very happy to say that we have some of the same customers we had when we started almost 20 years ago. We specialize in sports and non-sports trading card boxes, and we do it well. We carry primarily factory sealed boxes and sets from the 1990's to the present. With hard work, we have a pretty extensive inventory of boxes on hand and are continually working to obtain harder-to-find boxes that might appeal to our customers. Also, we really do care about what our customers want, and if there's a box we don't have, we'll try to find it for you. Please note that we don't carry vintage items, and we rarely sell singles - our focus is on what we do best. We pride ourselves on taking quality products, packaging them securely, and shipping them in a timely fashion; and doing all of that with friendly customer service. We're often told we have some of the best packaging in the industry, and we're confident that one of the reasons our customers keep coming back is because of it. As an example, any case order is automatically shipped double boxed for protection. Additionally, we have a guaranteed pre-order policy. If you order something from us, we deliver it. If a manufacturer unexpectedly cuts production and the price jumps, you will not hear from us that your order is being allocated. Even if we have to lose money, we will honor our commitment to you. It's important to us that our customers know they can trust their pre-orders with us. We're not a random dealer with no proven history or track record of delivery. We want repeat business. We take great pride in our customer service and value the friendships that we have formed over the years. We are happy to answer any questions that you may have about our company or the products that we carry. You should feel free to use our e-mail, suggest@gcxonline.com, for any suggested ways we can improve. We do listen. If you have never ordered from us, we hope you give us the chance to earn your business!